June 5th – One Sunday Service & Summer Schedule begins! This Sunday, June 5th, there will be only ONE worship service at 9:30 at the Pocahontas Center, due to annual conference. There is also no Sunday School during summer, but classes will resume in September. So, come and worship at whatever center fits your schedule, and we look forward to seeing you there! Registration Deadline for VBS “RELEASED” Day Camp is May 27th! Please help us spread the word so the youth in our community can get registered for our awesome VBS Day Camp by this Friday! Call your kids, grandkids, neighbors, and friends and ask if they have taken the time to sign up. 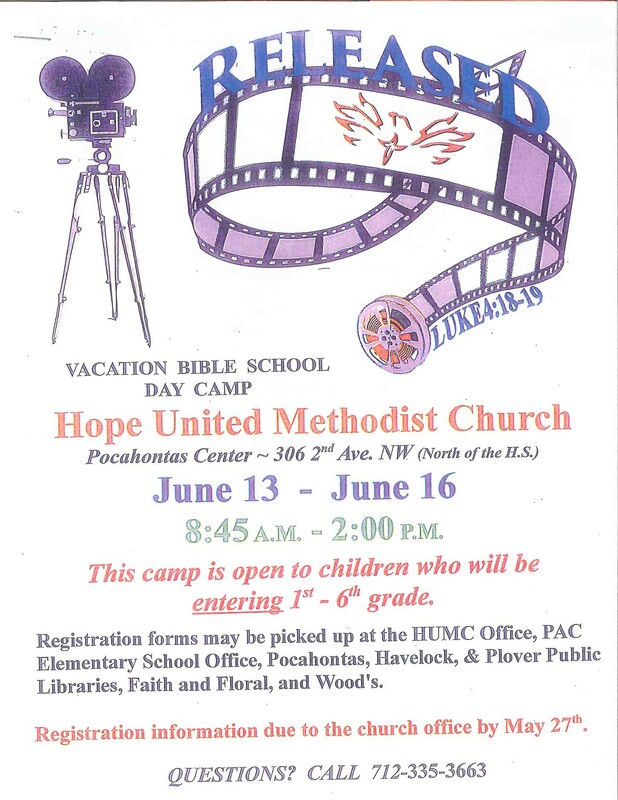 Registration form locations are on the poster below, but you can call the church office @ 335-3663 for more information. This is a great opportunity to help share God’s message to our youth. There are also many ways that you can help… there are still items that need to be donated and volunteers needed, so you too can be the hands and feet of Christ by helping out during this event! It’s Mobile Pantry Food Distribution time again!! Please remind your friends, neighbors, and family that may need some extra food to help stretch their meal budget to come to the Expo Center this Wednesday, May 25th, from 4:30 – 6:00. Also, if anyone is available to help unload the truck and set up, please call the church office (335-3663) or be at the Expo Center around 11:30 am. And then when that is done, anyone who is available to help with the distribution anytime between 4:30 – 6:00, please come on down to help!